One of the most irritating problems homeowners encounter in the maintenance of their homes is roof leak. Unlike other problems that are plainly visible through inspection and easily repaired such as damaged windows—where you only have to replace the broken parts—roof leak requires you to first locate the source before you could fix it. As if locating the leak source is not difficult enough, finding a product that actually works in patching the leak is another problem faced by most DIY practitioners. Practically every homeowner had experienced using a product specifically designed to stop leaks that did not exactly perform as they were expected to. These could be paints, adhesives, membranes or sealants that were supposed to prevent roof leaks. 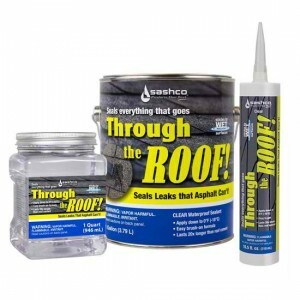 If you are tired of experimenting with these products and wasting your money, we suggest you give Sashco Through the Roof sealant a try. It permanently fixes persistent water leaks to keep rain and water out of your house. This metal roof sealant has been proven to last 20 times longer than asphalt, giving you valuable returns for your money. The price itself is very reasonable at $50.12 per gallon container. The sealant is ultra-clear when you first use it from the can and stay clear over time. For those who hate seeing yellowish tint on the roof, under the gutter and downspout, this product is right for you. The advantage of the metal roof sealant over similar products is shown by its superior elasticity that enables it to flex with changes in temperature and wind condition. That means the sealant stays put and will not crack or loosen when exposed to extreme elements. One of the most remarkable characteristics of Through the Roof is that it can be applied even when it is raining and the roof is wet. The sealant sticks to wet surfaces, allowing you to fix leaks on the spot. The sealant adheres to different kinds of roofing materials including metals (steel, aluminum and brass), plastics (PVC, urethane, polycarbonate, acrylic Sheet and nylon) and other surfaces (asphalt, brick, concrete, stone, wood, glass and porcelain). With its strong adhesion to surfaces, Through the Roof is suitable for use on the most common roofing fixtures and materials such as gutters, chimneys, skylights, shingles, vents, flashing and even rubber roof membranes. If you have to continue roofing work the next day, you can just leave Through the Roof sealant in your unheated garage without worrying about freezing. Take it out the next day and it is ready to use.